Over the last couple of weeks we've been recapping our efforts on turning an old and very outdated bathroom into our small but functional home office. After a significant amount of work to make the space a room, and then a bit of extensive work to turn our hacked apart oak floor into something refinished and beautiful, we had just one item left before we should start on our custom cherry desk. But that one remaining item has become one of the most interesting items in our home office - the exposed brick wall. 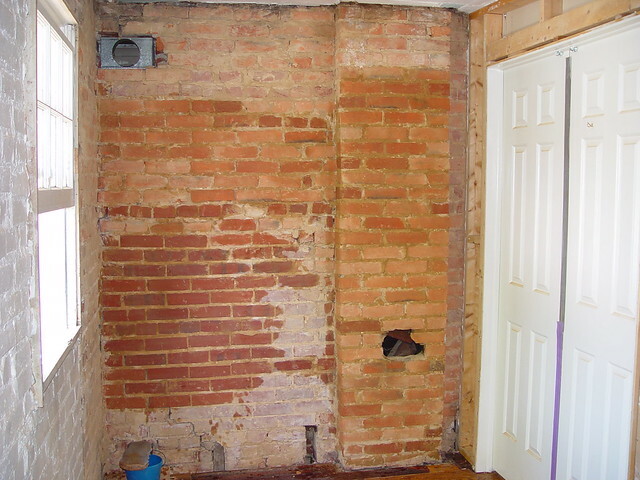 This wall was the original back wall of our house when it was built in the 1880s. Here it is before we removed the cracked and completely failed plaster. When we had completed the extremely filthy dirty task of plaster removal, we had our first look at what would eventually be our desk wall. Overall it looked pretty good and solid. There was the HVAC register in the upper left, a little cracking and settling on the bottom left, and a open spot in chimney that was once home to a stove that is long gone. The chimney is actually cut off just above this wall and doesn't exit through the roof, so this stove has probably been out of service for 100 years or more. ...and one day of pointing and repair. We felt he was a little too thorough in the work he did and the mortar was actually a bit too far into the brick, so before it fully cured Wendy and I scraped quite a bit of the surface of the mortar back. This gave us the look we were going for and we felt good with the end result. After we allowed the the mortar to cure, we cleaned the wall a few more times for good measure, then Wendy applied a coat of low luster, water based polyurethane to the wall to bring out the various colors. You can see just how much the poly made the reds, oranges, and yellows pop in the brick. We're absolutely thrilled with how our wall turned out, and we still love it every day we look at it. Since this is an interior wall and there was never any intention for an exposed brick look when the masons were building our house 125 years ago, the bricks are all different colors and finishes. I actually like the way this looks and I think it adds some visual interest to the wall. If you're thinking about doing an exposed brick wall, I absolutely recommend the use of low luster water based poly. It gives such a nice texture and color to the wall, without making it shiny and super glossy. After we wrapped up the work on the wall and put a coat of paint on the plastered walls, our office as a room was "complete." Now it just needed a desk. But oh that desk, that's a whole other story. In our final installment of this home office post series, we'll review the dramatic before and after photos, complete with a look at the other side of the room, opposite the exposed brick wall. So what do you think? 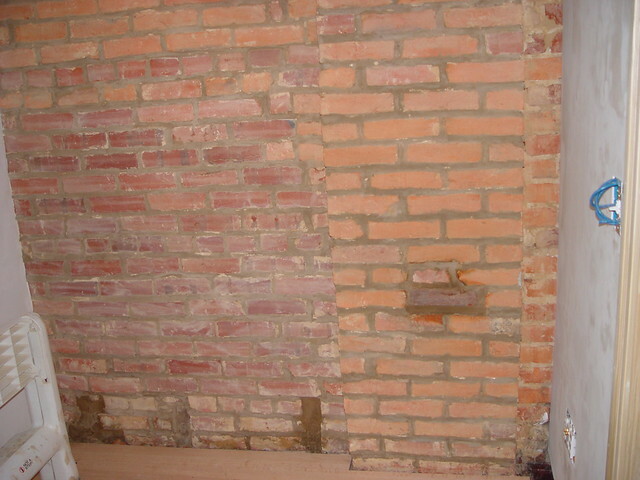 Did we make a good choice in exposing this brick, or if it was your home, would you have repaired the plaster? 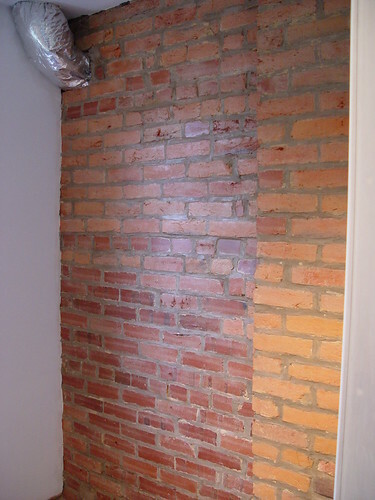 Do you have any exposed brick projects of your own that you've tackled, or an area that you've been dying to get your hands on? We'd love to hear all about it. 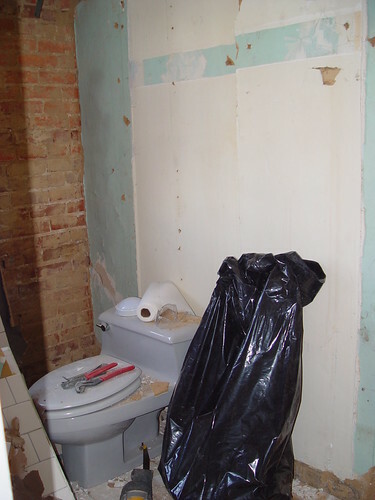 I will tell you in a couple of weeks how I would have repaired the plaster after I repair mine. I'm using a product from plastermagic.com I saw it on TOH and was enamored with how easy it looks to fix the plaster walls with. 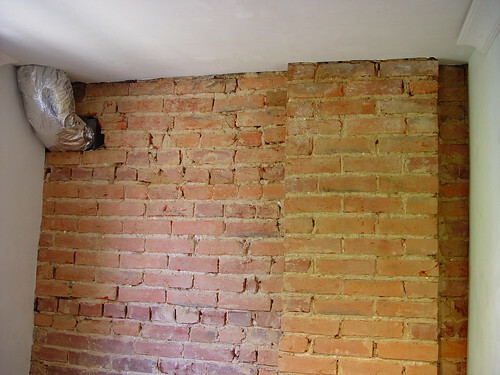 I do have a question for you after you fix you walls (cracks and such) have you ever had to skim coat the entire wall or do you just use a joint compound to blend the repaired crack with the rest of the wall. We are redoing our DR and this is our 1st battle with lath and plaster not counting demo. We actually skim all of the walls and ceiling in every room. It's total overkill, but if gives you a wonderfully smooth surface with slight irregularities. It tends to look like the old plaster would have after it was put up. It's gorgeous. Thanks for not painting it white! I'm so tired of seeing people paint brick fireplaces with white paint. I agree. I remember the "paint it out white" phase of Shabby Chic, I wonder how many million bricks are white because of Rachel Ashwell (though Wendy did love her style back then). All of the colors in the bricks are so warm and nice, it makes the whole room feel very comfortable. was it a full bath you demolished? i'm kind of surprised you would get rid of one! It was a full bath, but it was such poor use of space that we ended up getting a full bath and office out of it, so we didn't take any steps back in the process. I used a low lustre sealer on both the exposed brick in my bathroom and kitchen. It's crucial to keep things from being all crumbly, dusty, & gross.